As the name suggests, Mackinac is a small island in the northern tip of Michigan. This island is surrounded by Lake Huron. 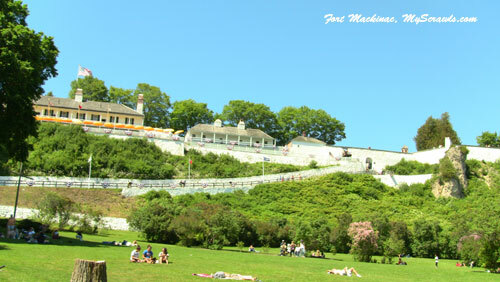 Mackinac island is a popular vacation spot and summer resort. This island covers a total area of 3.8 sq miles and has a circumference of 8 miles. 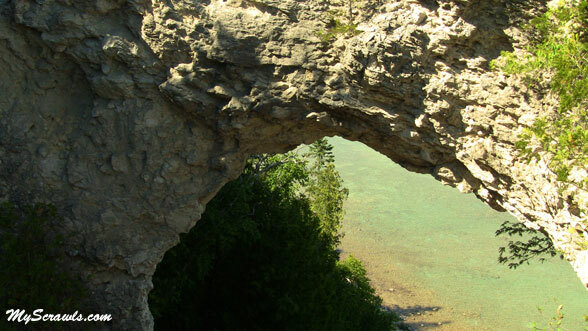 About 80% of the island belongs to Mackinac island state park. It includes Downtown Mackinac island, Fort Mackinac and dense wooded area. What’s special about this island? 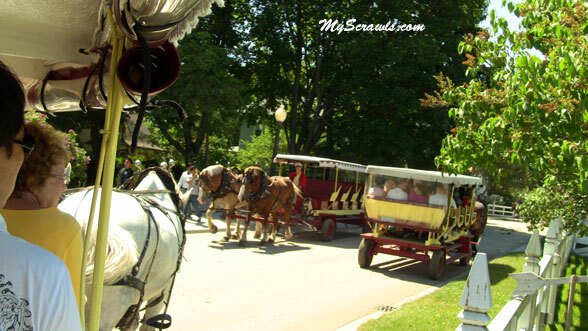 : Mackinac island is completely free from motor vehicles! The only mode of transportation within the island is bicycles and horse drawn carriages. Sounds interesting rite?! You can enjoy riding horse drawn TAXI (you hire for your family alone), horse drawn carriages (public tours) and horseback rides (you can rent a horse). How do we get to this island? : By Ferries or by flight. The first one is way cheaper You can drive till Mackinaw city, park your vehicle there, take the ferry and reach the island. Where can we park our vehicle at Mackinaw city: From Mackinaw city, you need to take ferry to Mackinac island. There are 2/3 ferry lines that operate catamaran between the island and the city. These ferry companies offer free parking too. You can either take one day parking or over night parking. Park your vehicle, get the ferry tickets and keep going! become a kid in the butterfly garden or just be yourself and laze around the parks and dense woods. Things to do with kids at Mackinac Island: Having a kid to tag along doesn’t have to stop you from holidaying at Mackinac island. There are bikes with baby carriages/cart for small kids. 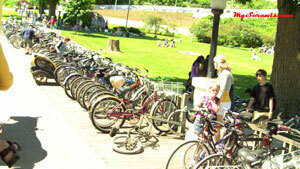 Remember at holiday session, these bikes with baby carriages maybe in great demand. Nevertheless, you can enjoy carriage tours. The horse drawn carriage tours stop at almost all the major landmarks in the island. It is a 1.75 hrs tour. 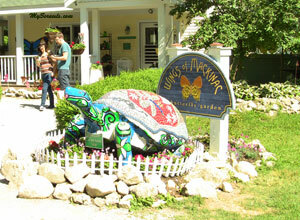 Don’t miss the butterfly garden! Also, you need not take the entire tour at a stretch. You can get down at the landmark stops, enjoy your time there and re-board other carriages that pass by. But remember to hold on your tour TICKETS! What’s the best time to travel to Mackinac island? : Spring through Fall. Few of my friends visited the island in late fall but by then most the trees had shed the leaves. Summer is my best bet! Temperatures reach low 70s in summer. Warm climate, chill breeze and blue waters! Ah… great place to be! Where to stay in Mackinac island? : Historic Grand Hotel and other B&B places in the island. If you opt to stay in the island be prepared to spend $$$ per night I would suggest you stay at the Mackinaw city (comparatively cheap) and take ferry to the island. Vegetarian Food in the island: Hmmmm.. not much options available. You do get veggie burgers, fries and sandwiches. I could hear a lot people (Indian vegetarians) grumble that they should have brought food from Mackinaw city! Make sure to take enough breaks. Allow the kids to stretch and play for sometime during the breaks. Do stop only at the rest areas. Toddlers may run around and it’s highly risky to stop at roadside parks. Do carry enough snacks, water and milk. Keep them occupied with music, rhymes or DVDs [I do not recommend DVD players for kids below 2 yrs]. Can we carry our own bikes to Mackinac Island: Sure you definitely can. You can take your bikes with you in the ferry till the island. I would suggest you take your own bikes coz you will spare yourselves waiting in long queues to hire the bikes! Wait time would be more in peak season. This is full of usful tips.. Keep up the good work. Thanks Sowmya and Divya Glad u liked the write up. Nice to read your travelogue!